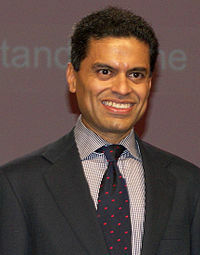 Just found a guy named Fareed Zakaria. I’m really impressed. This article, which he wrote for Newsweek in the aftermath of 9/11, was amazing. In its tone and basic ideas I feel vindicated that it says many of the same things I’ve been saying for years. And Mr. Zakaria has actual creds to his name, not just seat of the pants armchair theorizing like me. While the fact that I agree with him is nice for me, more importantly he speaks to and integrates many of the root ideas that other people skate around in favor of rhetoric. He doesn’t gloss over anything that I could see. While not claiming to be perfectly unbiased (impossible) he does present a solid, clear look at both sides of the issues he’s discussing. I’ll definitely be looking for and reading more of his stuff.